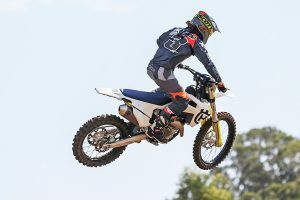 MotoOnline.com.au puts the quarter-litre machine to the test. 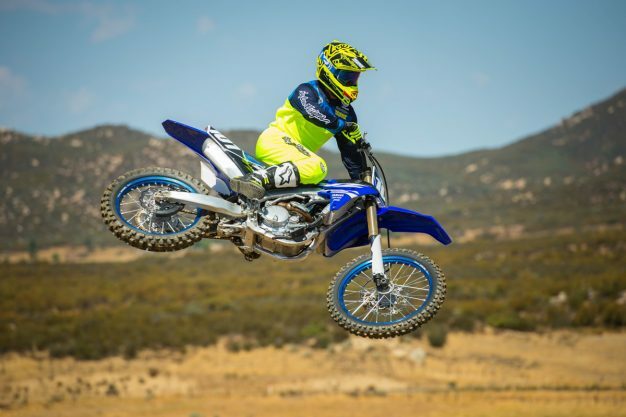 The Yamaha YZ250F has been the top of the class in recent years. One of the best litmus tests is to see what brand top privateer racers are choosing on a professional level. Those riders need the best platform in stock trim because they have to compete with a fraction of the resources of the top race teams. For the past few years there has been a surplus of blue bikes in the 250 class. 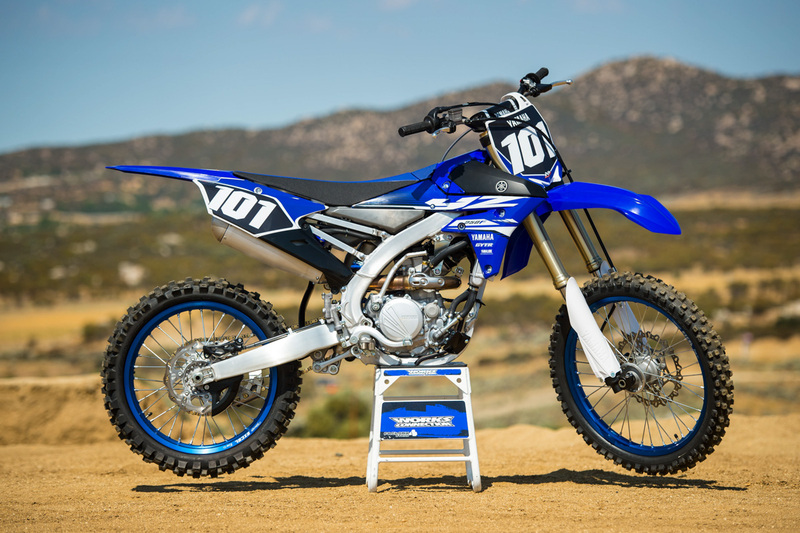 The 2018 YZ250F didn’t get many changes – the new model features blue rims and some sweet new graphics that sharpen up the look of the Yamaha. There are some haters but I love the blue rims and they definitely give it a factory look. We rode the new Yamaha at Cahuilla Creek Raceway in Anza, California. 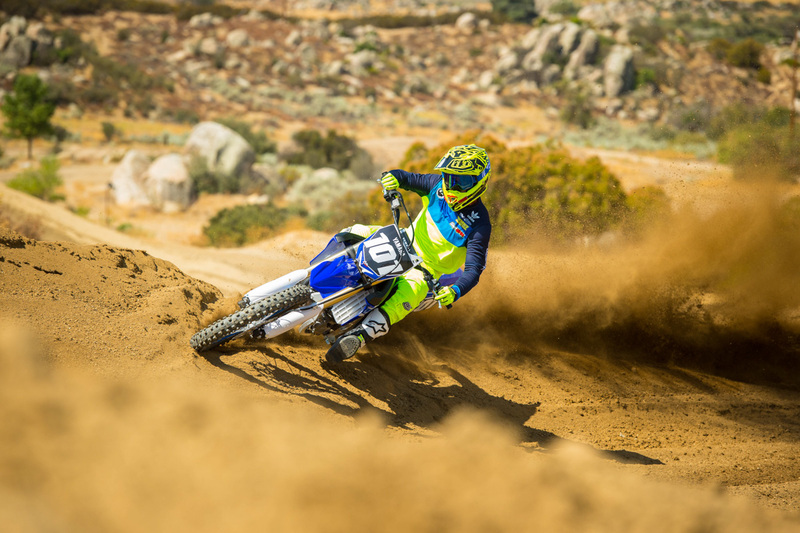 The Cahuilla circuit has major elevation change, soft to hard pack soil and a mostly natural layout. It sits at just over 2000-feet of elevation and on our test day the temperature was 75 degrees fahrenheit. This is an excellent test track because of the hills and the soil, which builds up big braking bumps, acceleration chop and soft berms around the turns. The elevation puts an extra strain on the engine so any deficiency in the power plant is accentuated. There are tight sections and fast, sweeping straights so you get a good sense of what the chassis does well and what it doesn’t. The engine on the Yamaha is probably the best 250F engine ever made. That might sound like hyperbole but the design of the engine suits the smaller, higher-revving engine. The power and torque are substantial down low allowing you to ride this bike like a 450. If you can carry any momentum at all through a turn you can pull taller gears and lug the YZF engine. The meat of the power is in the middle of the RPM range but the engine continues to pull well up into the atmosphere. This motor is well-rounded and it suits a wide range of riders as well. 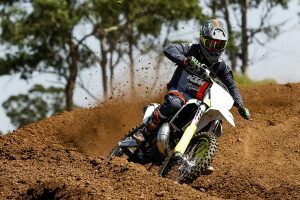 Pros will love the sheer horsepower and torque numbers while novice riders will enjoy the breadth of the power, which makes it easy to ride. The one downside, if you can call it that, is the sound that barks back from the airbox. The down draft design and elevated air filter means you have a front row seat to the growling/sucking sound coming from the throttle body. Until you get accustomed to it the sound is distracting and annoying. After a couple days you forget about it and it becomes normal. I recommend riding with foam ear plugs if you haven’t tried it. The chassis is good on the Yamaha, but not great. The bike feels tall and like the front wheel is slightly over-weighted. That feel can make the bike difficult to turn in certain situations. However, the bike is comfortable, the brakes are strong, the clutch has a good feel, and the cockpit is natural feeling. The suspension is amazing. Honestly, this is the best suspension in the game at the moment and it’s really not even close. The initial portion of the stroke is plush and glides over small chatter and chop. When you land hard the KYB suspenders are perfectly progressive and absorb the hit with a supple stroke. The stock setting will satisfy a wide range of skill levels and weights, which is as impressive as the performance itself. Every other brand would be wise to mount this stuff straight onto their bikes. 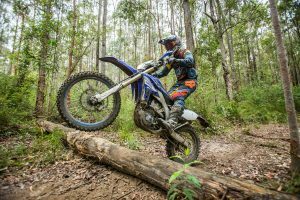 The Yamaha is excellent through the bumps and tracks straight at speed. It’s difficult to say what to change on this bike that isn’t rider specific. I like a longer link arm on the Yamaha and the forks slid up in the clamps to bring the whole bike down a bit. This gives the bike a lower center of gravity and makes it turn easier, in my opinion. However, taller riders may not like this feeling. 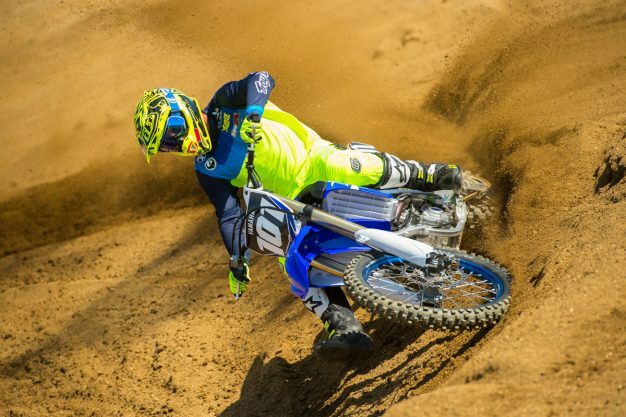 To keep a broad appeal, Yamaha doesn’t want to make changes that specific groups like. Electric start would be nice and I imagine it’s only a matter of time. The grips are also thick and old-school and could be replaced with a more quality pair of grips. Though it has improved in recent years, I would still like the bike to be a little thinner through the middle section of the bike. All in all, this is an incredible bike and it is very difficult to pick it apart.